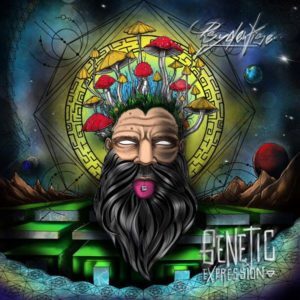 Our Minds Music is excited to present our first full-length solo album, Genetic Expression, by none other than our Garden Route psy-pirate Psydewise (Sam Wise). Expect to hear fat and rubbery bass lines, vast dynamic soundscapes, and intricate layers of offbeat percussion lines. He also blessed us with some faster twilight and forest tracks to take you deeper into the jungle. Mastered by Dale Byl at db Mastering, Cape Town, South Africa. Artwork by Aja Louther, Leigh Soulink and Ryan Vaughan. MP3 Download | FLAC Download | WAV Download · Download count: 23,965. Why producers destroy their good music with vocal samples all the time? Awesome release! Always nice to hear a new release by Psydewise. I think this one’s my favourite so far! Really nice stuff here! Thank you for sharing. Muito bom. Se podesse upr em um site por exemplo: medifire, 4shred, meg… Melhor, Obrigdo.